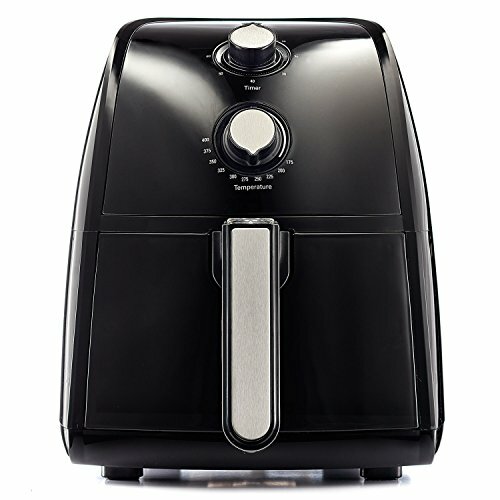 The Bella 14538 2.6 Quart Air Fryer offers everything you would expect from a smaller air fryer. This low cost model has simple temperature and timer controls that can be easily mastered even by novice cooks. The frying basket is removable and dishwasher safe, which makes it a favorite for home cooks who are short on time. The Bella 14538 prepares small amounts of fried food, making it ideal for singles and couples. The size is not conducive to cooking for large families or crowds. The Bella 14538 comes with the standard frying basket and pan used in all recipes. You will also receive a user manual. This budget-friendly model does not include any additional accessories. The user manual does contain 10 pages of recipes for use with this model. The air fryer weighs about 10 pounds. Its dimensions are 14.2″ x 11.4″ x 13.2″. It is available only in neutral black with matte silver controls and handle. It is an unobtrusive design that should coordinate well with both classic and modern kitchens. The non-stick basket has a 2.6 quart capacity. This is the right size for cooking air fried foods for individuals and couples. There is no divider included with this model. This is a simplistic machine that is very easy to master. It includes two dials that are manually used to cook the foods of your choice. The timer allows you to cook food for up to 60 minutes. The adjustable temperature control gives you a wide range from 175 degrees to 400. The stainless steel heating element gets hot very fast, letting you cook even frozen foods in a small amount of time. The indicator lights on the machine let you know when the power is on and if the unit’s heat is on. The Bella air fryer offers an overheating protection function. The removable basket is completely dishwasher safe. The 1500 watt convection heating system uses a standard US outlet. The vast majority of reviews on this air fryer are very positive. Customers love how easy it is to use. Because there are no digital presets, the learning curve to the Bella 14538 is very small. Customers are also very excited about the easy cleanup. While the frying basket is dishwasher safe, it is also easy to clean by hand. One of the few negatives is that the fryer takes up a large amount of counter space for a smaller capacity basket. This air fryer has a two year, limited warranty. The warranty covers all mechanical defects in materials and workmanship. The warranty allows for the manufacturer to either repair, replace or refund at its discretion. In addition, all non-mechanical parts are covered for 90 days after the date of purchase. The warranty does not cover any damage that is due to normal wear and tear. It also does not cover accidents or any damage that is due to misuse of the product. Should I Buy the Bella 14538? The Bella 14538 is a good choice for people who are on a budget and don’t have many mouths to feed. It does not have the bells and whistles of its more expensive counterparts, but it does perform just as well if not better than others. We recommend this fryer if you want to try out a simple air fryer to make small amounts of food. This can serve as an excellent introduction to air fryers. It also makes a great gift for housewarmings, graduations, retirements and more.